P.S : I learnt this recipe from one of the sites which I happen to come across more than a year ago and now I cannot recall which one. Therefore, I do not claim this to be my original recipe. I just happened to follow cooking instructions pretty well ! Mix all of the above ingredients and let the chicken marinate for 6-12 hours, more the better. While the chicken is marinating, slice the onions very thin. You can use a food processor for this or a slicer. Now heat oil and fry these sliced onions in batches. The heat should be medium. Definitely not high, otherwise the onions will get burned. Stir the onions continuously for uniform browning. When they become light brown, drain them on kitchen paper. Keep them aside. They will get nice crispy as they cool down. Take a deep, wide mouth vessel and heat 3-4 tablespoons of oil in it. In this add the bay leaves, cloves, cinnamon, cardamoms, little bit of shahi jeera and allow to crackle. Now add a tablespoon of ginger garlic paste and stir a little. Now tip out all the marinated chicken and the marinade. Cook on a high flame so that the water gets evaporated quickly. Add the chopped tomatoes, mint, green chilies, all dry powders(coriander, chili), and salt. Cook till the chicken is cooked and the gravy (masala) is not watery. Add one third of the fried onions. Mix well. Keep aside. Boiling rice is one of the most important part of cooking a biryani. The rice needs to be parboiled. Meaning, it should be three fourth cooked. The rest of it gets cooked on dum (when we layer the chicken and rice, seal it and put on a very slow fire). To boil the rice take a big deep wide mouth vessel, add lots of water (at least 10 times more than rice). Add ample salt (this is very important because the rice needs to be salty when cooked). Also add a cinnamon stick, a couple of green cardamoms, a few cloves and the rest of caraway seeds (shahi jeera), for flavoring the rice. Now boil all this for a few minutes on a high flame (7 minutes or so). This is how to check if the rice is done. Without burning your fingers, take a few grains of rice (use a clean spoon to take some out of the boiling water), break a grain, if it breaks into 3 parts easily, your rice is done. Strain the rice and spread it on a clean surface ( a tray or something), so that it cools faster. If you want to pick out the whole spices which you added, you can do that now. Or else just let them be. Now that the rice and chicken are cooked. Fried onions are ready. You just need to get a few more things organized, so that the layering can be done. * Boil the milk and add crushed saffron in it. Give it a stir. * In desi ghee, fry the cashew nuts till golden brown. Also the almonds and raisins, if using. Keep aside. * Keep some melted desi ghee aside. Take a heavy bottom pan with a lid (non stick is best). * then a layer of chopped coriander. Repeat and finish off with the rice layer. Lastly, sprinkle the leftover fried onions (if any), cashews and other nuts. Pour the saffron milk on top. Also pour some desi ghee down the sides of the pan and some on top of the rice. It will trickle down with the heat. Yep, you are done. Seal the lid by sticking it with some chapati dough or simply fix a big foil before placing the lid. The idea is to restrict the steam from escaping. Place this pot on a very slow flame. Ideally place this vessel on top of another flat pan or tawa, so that the bottom of the pan doesn’t come in direct contact with the heat source. ave for one hour. 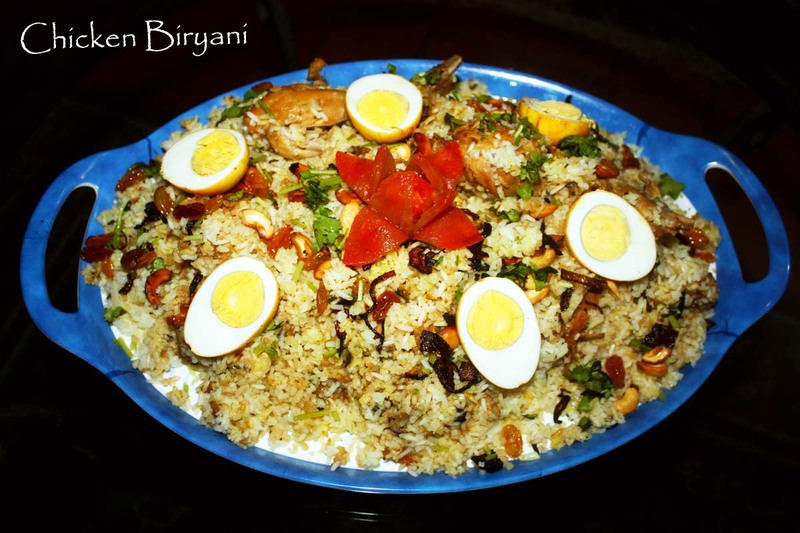 When you open it, what you get is the magical, flavorsome and aromatic chicken biryani. Please dig in. Don’t forget to prepare a Raita while your biryani is cooking. Enjoy hot biryani with a cold raita. Check out the recipe for Cucumber Raita.